The Federal Aviation Administration will be holding public hearings on proposed air tour alternatives to the public, like routes and altitudes used by operators when providing air tours of the Hawaii Volcanoes National Park. The meetings provide an opportunity for the public to review and comment on alternatives. The meetings will be held at the Hawaii Volcanoes National Park Kilauea Visitor Center at 5:30 pm on April 18th. There will also be meetings in Pahoa and Naalehu. Public comments must be received on or before June 6, 2011. The National Park Service (NPS) and the Federal Aviation Administration (FAA) invite the public to comment on several preliminary alternatives as part of an effort to develop an Air Tour Management Plan and Environmental Impact Statement for Hawai‘i Volcanoes National Park. The alternatives are described in a newsletter that is available for public review and comment for 60 days, with comments due by June 6, 2011. An Air Tour Management Plan (ATMP) is being developed to address the 2000 National Parks Air Tour Management Act, which requires parks to respond to the growing number of air tours over national parks. The FAA is designated as the lead agency for the plan which should offer effective measures to mitigate or prevent the significant adverse impacts, if any, of commercial air tour operations upon natural and cultural resources, visitor experiences and tribal lands. “Hawai‘i Volcanoes is known for spectacular volcanic landscapes, significance of Native Hawaiian culture, Hawaiian species found nowhere else in the world, and for vast expanses of designated wilderness that stretch from summit to sea,” stated Cindy Orlando, Park Superintendent. “Whether it’s the crackling of new lava, song of a honeycreeper, or a magical Hawaiian chant floating across Halemaumau Crater or just silence—the soundscapes of Hawaii Volcanoes are unusual and valued as part of the park experience. 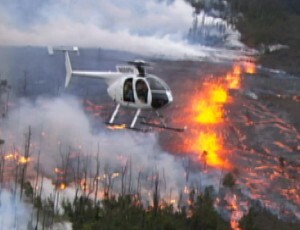 Hawaii Volcanoes National Park currently has 14 helicopter and fixed wing air tour operators who have been granted authority to fly a total of 28, 441 air tours annually over parklands. The park’s annual flight numbers are second only to Grand Canyon National Park in terms of highest number of air tours flying over a national park. Commercial air tour operations are defined as any flight conducted for compensation or hire in a powered aircraft, where a purpose of the flight is sightseeing over a national park, within ½-mile outside the boundary of any national park, or over tribal lands during which the aircraft flies at or below 5,000 feet above ground level (AGL). A newsletter that includes alternative descriptions, maps and a comment form is available online. Hard copies will also be available at public libraries and at the park after April 8. The public can review and comment on alternatives by accessing the newsletter online at http://parkplanning.nps.gov/projectHome.cfm?projectID=36002 or the park web page at www.nps.gov/havo/parkmgmt/plan.htm. Comments can also be mailed to Superintendent, Hawaii Volcanoes National Park or provided at one of the open house meetings. Comments will be accepted through June 6, 2011. The FAA and NPS will host three open-house style meetings on Hawaii Island for the public to share ideas and comments about commercial air tour flights above Hawaii Volcanoes National Park. Monday, April 18, 2011, 5:30-7:30 p.m.
Tuesday, April 19, 2011, 5:00-7:00 p.m.
Wednesday, April 20, 2011, 5:00-7:00 p.m.